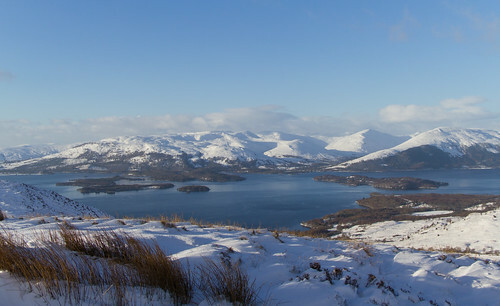 Took advantage of a slight rise in temperatures and the promise of sunshine to climb Conic Hill last Sunday. 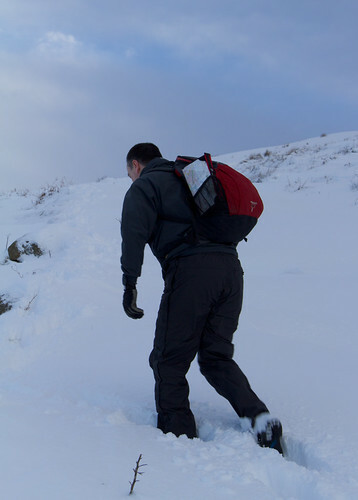 After a slow and slippy drive to Balmaha it was on with the boots and gaters for the short 400 metre climb. Although the car park had a few cars the hill was pretty deserted and we only saw two other chaps all day who had abandoned their climb up Ben Lomond. At lower levels there was a bit of a thaw on and the snow was quite wet and slippy. After a half hour we had left that behind and were in to the actual climb. Proper snow! It didn’t take long until we got to the top of the first summit – Conic is actual three small summits and as we clambered on the sun came out and gave us some glorious views of Loch Lomond, the Arrochar Alps and Ben Lomond. Despite the sun and the thaw at lower levels it was f-f-freezing at the top. A pretty brisk wind meant we didn’t hang around for long at the top and we walked down a bit to have some lunch. After a quick soup we decided not to clamber over the hill again but head further down the slope as we’d surely find a path. Wrong. We found a very old wood and a peat bog so not the best decision we’d ever made. 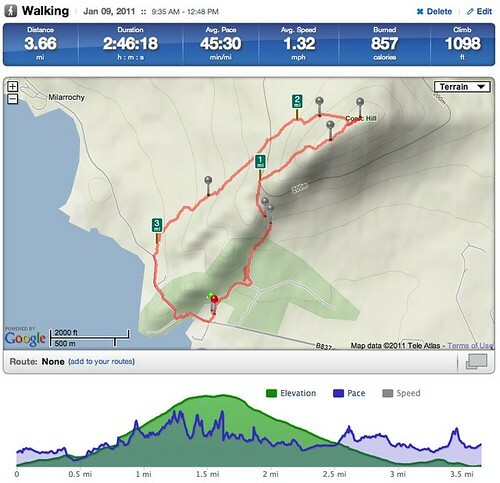 Hence the RunKeeper map showing a circular route that doesn’t really exist. The full set of pics from the walk is as usual on Flickr including the panorama above which came out quite well.